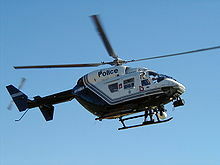 The MBB/Kawasaki BK 117 is a twin-engined medium utility-transport helicopter. It was a joint development between Messerschmitt-Bx�lkow-Blohm (MBB) of Germany and Kawasaki of Japan. 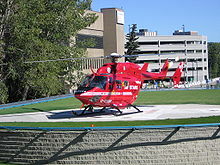 MBB was later purchased by Daimler-Benz and eventually became a part of Eurocopter. The BK 117 is popular for passenger and VIP-transport, seating from seven up to 10 people. It is also used for aerial crane and sling work, law enforcement, and military transport, and is exceptional as an air ambulance and search and rescue platform. Its successor was developed from the BK 117C-1 version. 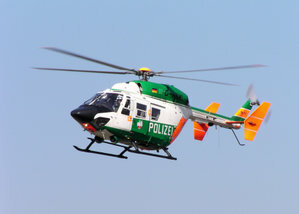 It is produced as the EC 145. The BK 117 was a joint development between MBB and Kawasaki based on an agreement made on 25 February 1977. The agreement would replace two separate projects for twin-engined general purpose helicopters; the Bo 107 by MBB and the KH-7 from Kawasaki. Costs were shared equally, with MBB developing the rotors (based on the rigid rotor system used on MBB's Bo 105), tailboom, flight controls and hydraulic system and Kawasaki developing the landing gear, airframe, main transmission and other minor components. Each company would have its own assembly line producing aircraft for local markets. Each company was to build two prototypes, to be completed by 1979; one for flight testing and the others for tie down testing and static testing. MBB's flying prototype made its first flight at Ottobrunn on 13 June 1979, followed by the Kawasaki prototype at Gifu on 10 August 1979. Development was slower than expected, a problem made worse by shortages of skilled manpower available at MBB. Although it was originally planned for airworthiness certification to be achieved before the end of 1980, German certification was not achieved until 9 December 1982, with Japanese certifiation following on 17 December, and the all-important United States FAA certification being obtained on 29 March 1983. A single BK 117-A3 was leased by the Canadian Forces Air Command for a test program and designated as the CH-143. When the program was over, the aircraft was returned to MBB Canada. Originally known as the BK 117-C2, the EC 145 combines the original BK 117 design with a much larger cabin, and modern features from the EC 135. German prototype, first flown 13 June 1979. Japanese prototype, first flown 10 August 1979. Powered by two Lycoming LTS 101-650B-1 engines. Introduced in 1985, the A-3 has a larger tail rotor with improved blades, and the take-off weight increased to 3,200 kg (7,055 lb). Introduced in 1986, the A-4 has increased transmission limits at take-off power, improved tail rotor head. German aircraft have provision for extra internal fuel, giving enhanced performance. Military version introduced in 1988. The A-3M is fitted with taller skids and can carry 11 troops. A Browning 12.7 mm (0.5 in) machine gun can be mounted under the fuselage in a Lucas turret with 450 rounds and controlled by a helmet-mounted sight. The A-3M also has outrigger pylons can hold up to eight HOT II or TOW antitank missiles or a variety of air-to-air missiles, rocket-pods, or forward-firing cannons. Provisions for a doorway gunner's position with a 12.7 mm (0.5 in) gun can also be installed. Introduced in 1987, the B-1 is fitted with LTS 101-750B-1 engines to provide increased performance, and a 140 kg (309 lb) increase in payload. UK-cerified version with reduced range and endurance. Powered by two Turbomeca Arriel 1E engines. Later models may be upgrated to Arriel 1E2 engines. powered by two Turbomeca Arriel 1E2 engines. License-built model produced in Indonesia. Introduced in 2010, the 850D-2 variant is a STC (Supplementary Type Certificate) development of BK117B-2 incorporating Honeywell LTS 101-850B-2 engines aimed at improving OEI and Category A performance . Development and certification was conducted in New Zealand in conjunction with Honeywell. 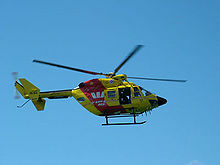 The majority of the helicopters are operated by various emergency services although it is also operated by private individuals, companies and executive charter operators. Canadian Forces Air Command - A single BK 117-A3 was leased by the CF for a test program and designated as the CH-143. When the program was over, the aircraft was returned to MBB Canada. "BK 117...a Terrestrial Space Ship". Air International, Vol 36 No 4, April 1989. Bromley, UK:Fine Scroll. ISSN 0306-5634. pp. 163-170. Lambert, Mark. Jane's All The World's Aircraft 1993-94. Coulsdon, UK:Jane's Data Division, 1993. ISBN 0-7106-1066-1.